Paso Robles, Calif. – March 12, 2015 – Lazer Star Lights sponsored racers are rolling into Las Vegas, NV this week in preparation for the Best in the Desert Mint 400. Known as “The Great American Off-Road Race,” the Mint 400 will put Lazer Star sponsored race teams up against some of the best off road competition in the world as participants take on this challenging desert course. Lazer Star Lights is proud to announce the renewal of several partnerships for the 2015 race season. Matt Lovell of Matt Lovell Racing and Dana Nicholson of Fleshgear/Fuel Off Road will represent Lazer Star in the trophy truck classes, while Jason and Derek Murray of Murray Racing and Bryan Buckhannon of Buckhannon Racing will compete in the UTV Pro class. Jason and Derek Murray will represent Lazer Star in BITD and SCORE UTV races. The Murray Brothers are well-known in the world of UTV racing for their tenacity and competitiveness. Derek and Jason work hard to prepare for Best in the Desert and SCORE events, and as a result set high expectations for themselves. This winner’s mentality paid off several times in 2014, as Murray Racing took the checkers in the SCORE Imperial Valley 250. 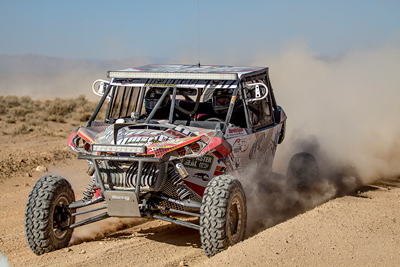 The victory, in addition to several other strong finishes including 2nd in the San Felipe 250, earned the Murray Brothers 4th place overall in the 2014 SCORE UTV Class Championship. 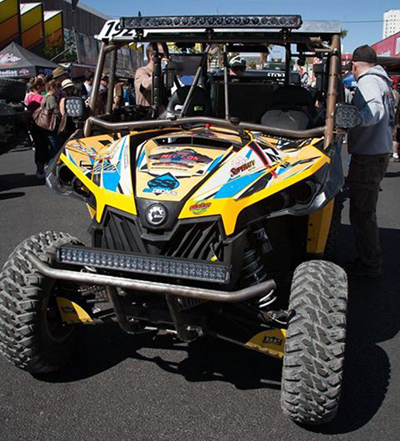 Murray Racing also finished 3rd overall in the 2014 BITD UTV Pro Championship. Their mission will be no different in 2015: win races and win championships. Their new turbocharged Can-Am Maverick X ds should help with that. this year as the GNCC champ shifts his focus to UTV racing. Bryan Buckhannon has been a fixture in GNCC Racing since the mid-2000s, and since his first class championship in 2008 has dominated the 4×4 ATV competition. In total, Buckhannon has claimed six 4×4 Open championships, highlighted by his perfect season of 13 consecutive victories in 2013. In 2014, Buckhannon also ventured into UTV racing, participating in GNCC and select BITD events. Bryan is a pure competitor, and we look forward to seeing what this champion will do in 2015. Lazer Star Lights is a proud support of off road racers of all levels. In addition to supporting several race teams through their Race Program each year, Lazer Star also offers product and cash contingency for qualified racers in multiple race series in 2015. Click here for more information about Lazer Star Lights Race and Contingency Program. To learn more about Lazer Star Lights products for enthusiasts and racers alike, visit www.LazerStarLights.com.